Two Potbelly seahorses holding tails at the Tennessee Aquarium in Chattanooga. If you need inspiration this Valentine’s Day, look no further. 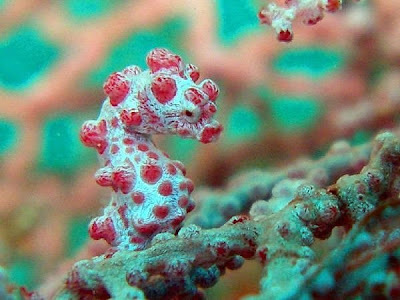 Seahorses can teach humans many a lesson when it comes to courtship. They hold hands, uh, tails, change colours, swim snout-to-snout and whirl around in unison for days before engaging in a “true courtship dance” that lasts about eight hours. When one thing finally leads to another, it is the male of the species that becomes pregnant and carries the offspring. 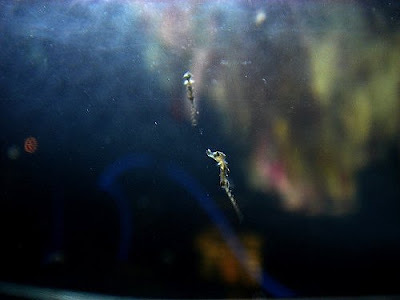 The eggs then hatch in the male seahorse’s brood pouch for about two to four weeks, depending on the species. The female does not withdraw at this time, but visits her mate every morning to continue the courtship by wheeling around, changing colour and holding her mate’s tail. This support fosters a monogamous relationship, at least during one reproductive phase, that keeps the male motivated to nurture and the female to continue producing eggs. Offspring survival rates are low: only about 5 of each 1,000 infants reach maturity. 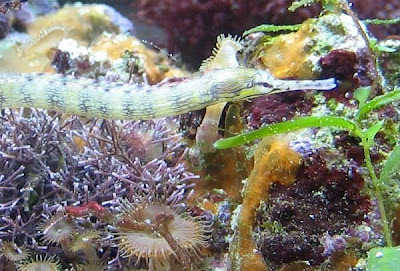 This explains why seahorse litters can be large – from a few dozen to hundreds to even 1,500. 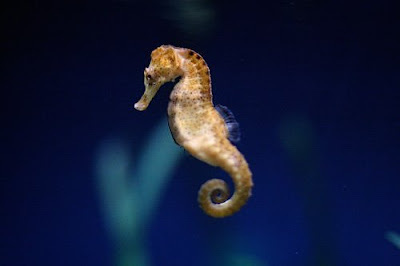 But seahorse babies’ chances are still better than that of many fish because of the incubation time in the father’s pouch, during which they are protected and receive ample oxygen supply. 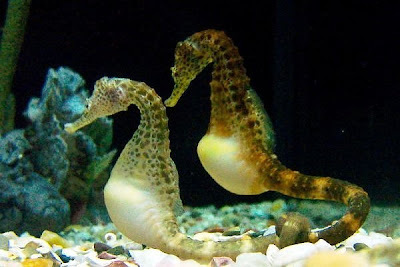 The male seahorse, though not lactating, even produces prolactin, the same hormone found in pregnant women. 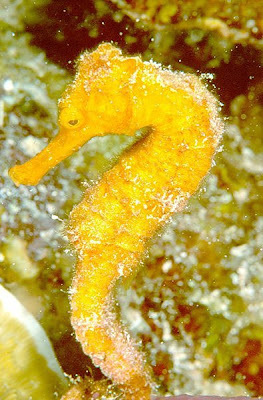 When ready to be born, the male seahorse experiences muscular contractions and then expels the “fry” from his pouch, usually at night. 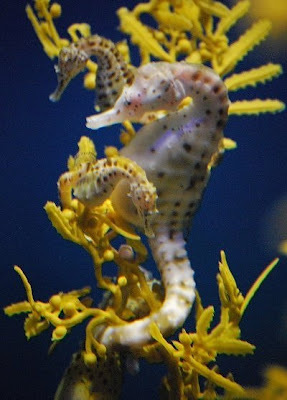 Once out, the young seahorses are on their own because seahorse parents, like those of most other fish species, do not take care of their offspring. How could they? They are busy preparing for the next batch of eggs, which is ready by morning and has to be deposited within a few hours, else they would go waste. With this busy a schedule, it is good that there are reproductive “time out” periods during which both male and female seahorses can regain their strength, which they really need to do. The female’s eggs make up one third of her body weight, which the male then needs to receive and provide nutrients for. This should change soon as Hall is also the cofounder of Project Seahorse, an international project furthering the study and conservation of seahorses. Well, I suppose fact #40 makes sense because you figure the size you are when youre a baby and the size you are as an adult, that youre bones expand rather than multiply.